Recently, our garden has been going well and the apple trees are finally growing apples! Sadly though, we have pest problem. 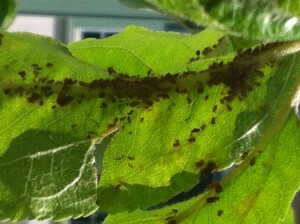 With the arrival of fruit on the trees, aphids are growing in numbers. Even with the increasing number of ladybugs being spotted nearby we must take the matter into our own hands. We are going to try spraying the leaves with soapy water which is supposed to help get rid of aphids. 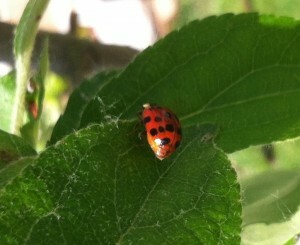 We are also hoping that the ladybugs around will take care of some of them. If these things don’t work, then we are going to buy some ladybugs.